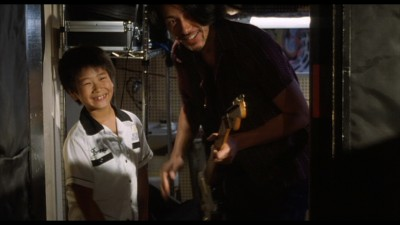 In 2004, the quietly masterful Japanese director Kore-Eda Hirokazu (After Life, Still Walking) made Nobody Knows, a shattering film based on a true story, using nonprofessional child actors, and in large part utilizing an off-the-cuff, quasi-documentary style to effectively drive home the grim situation of siblings whose mother abandons them. Kore-Eda's latest feature, the winsome I Wish, just now being released to DVD, reveals itself to be very much a companion to Nobody Knows (the two would make a sublime double feature): In mood, it's 180 degrees from the tragedy depicted in Nobody Knows, but I Wish uses notably similar means to take and develop its rich portrait of what contemporary Japanese childrens' lives in mid-size cities look and feel like, both in their wide-eyed, fanciful, literally "childlike" aspects and in their more solid, mundane realities. No "redemption" was ever needed for Nobody Knows's masterfully and empathetically made (while also very troubling) look at children who are utterly failed by the adult world's neglecting of its responsibilities to them, but I Wish does provides a perfect balance for that picture. It's a counterweight in Kore-eda's filmography, a yang to Nobody Knows's yin, wherein contemporary childrens' lives in Japan's smaller (i.e., not Tokyo or Osaka) outlying metropolises are less despondent or troubled, more bittersweet and guileless rivers flowing toward the choppier waters of adulthood. The wishing referred to in the title derives from a more tangible connection that's in the works between the brothers and their two towns: a soon-to-be-completed extension of Japan's storied bullet-train lines that will run between Kagoshima and Hakata, much better facilitating travel between the two places and physical connection between their people (even, in a point never overemphasized, split-up families). The film's main storyline revolves around Koichi and Ryu's grappling with their distance and their parents' rancor, and the fanciful scheme they develop to get them back together, which is based upon the boys' whimsical, apparently self-invented notion that, if they're present at the exact spot where two bullet trains traveling in opposite directions, at top speed, between their towns, any wish they make at that moment will have serendipity on its side and therefore come true. But the brothers, their conundrum, and the heavily-planned odyssey they and their friends eventually undertake to make their way to the wish-fulfilling sweet spot are just an epicenter for the film's ever-widening circle of sincere interest in and empathy for all of its "little" people's "ordinary" lives, setbacks, and hopes. When we cut, for one example, to a very brief shot that reveals the boys' mother has taken the supermarket-clerk job she was initially unwilling to because of the shame she, at age 30, would feel were her former classmates to see her reduced to wage-slave status (or, for another, when one of Ryu's friends, a sweet-natured aspiring actress already landing parts in commercials, bears the brunt of her mother's discouraging hostility and derives courage from the bullet-train expedition with which to assert herself), it feels not at all like digressions, but a natural, ever-widening circle of Kore-eda's assured design that wants to encompass as much of life as it can. Thus does I Wish casually reveal its true nature as a relaxed, subtle, character-driven picture whose plot has been kept simple by design to allow it plenty of air to breathe, a liberating "slowness" that lets us feel the various rhythms of not just Koichi's and Ryu's lives, but that of a great many of the people, and even big swathes of the entire cities, around them. Emphasizing anything "symbolic" is the last thing this deceptively modest movie would do, but the wary viewer will note that one of these little details encompassed by the expansive, unconditional hug I Wish means to give its characters are the little cakes Koichi's and Ryu's grandfather hopes to market, which have a flavor described alternately as faint and, more accurately, as mellow -- also the perfect description for the not-too-strongly sweet flavor of the film itself. The performances are roundly unaffected and naturalistic in the best way, vindicating Kore-eda's choice to work with mostly nonprofessionals (particularly the children), but Kore-eda's style, too, though always flexible and self-effacing, has been modified to fit his story. None of his work that I've seen is ever less than calm and relaxed in its pacing, eager to let us slow down and get a real sense of the simple richness of the lives being lived onscreen. Here, though, he lets not just the pacing but the stylistic parameters themselves relax in a more literal way, to the point of becoming almost freewheeling: He's given us forays away from his most recognizable, contemplative, Ozu-like compositions (for which there are still plentiful occasions in I Wish) before, veering off into cinema-vérité hand-held sequences in Nobody Knows; here, however, he segues more freely between those modes, and finds plenty of room left over for surprises without precedent in his work, like the aforementioned pop/rock score, or a breathtaking, entirely unexpected and spontaneous-feeling montage at the film's crucial moment that includes within it flashbacks and even animation (!) as one of the children's drawings comes to brief, smile-eliciting life. Kore-eda is too sage, sensitive, and inventive to force his film to conform to preconceived notions of what it means to be a child (full of wonder, etc. ); he builds the film's joyful tone and lyricism from the elemental level up, improvising with the kids from a skeletal script and bringing a child's simple, unabashed eagerness to the film's camera eye (and to the wonderfully intuitive flow of the editing, which he has not incidentally undertaken himself). Even the most humdrum urban-infrastructure settings are granted a delicate, light, sunset-pastel feel through the grace of Kore-eda's blockings and rhythms, all immeasurably enhanced by Yutaka Yamasaki's (Kore-eda's habitual cameraman) kindred-spirited gift for lighting and lensing the film's children and their worlds. It's just slightly misleading to claim Kore-eda as an heir to Ozu, since the great, late Ozu's and his contemporary countryman have ways of showing us life that differ significantly (Ozu's compositions are always meticulously precise and most often quite still, whereas Kore-eda, though many of his shots of daily/familial life in the Japanese city certainly do partake of that contemplative stillness one associates with Ozu, has a less minutely concentrated sensibility and is sometimes just as likely to give us New Wave-style shaky-handheld shots or wide, Antonioni-esque views of his characters placed firmly within their natural and architectural environments), but the comparison is both tempting and apt, for the life they mean to show us -- its joys and tragedies inevitable, its worthiness unmistakable and inherent in each everyday, even mundane detail -- is very much the same. It's not that I Wish is any more or less life-affirming, for all its markedly more ebullient tone, when compared to the other Kore-eda films that have made him a name in the West, at least among the cinephilic. If anything, his more subdued, more melancholy films are living, irrefutable proof that life needn't always be affirmed through frenetically happy endings or forcible accentuations of the positive, and can in fact be much more deeply appreciated through a calm, accepting acknowledgment of human life's inevitable snares and reversals. But I Wish does distinguish itself as perhaps the purest, simplest (though never simplistic), most unqualified expression yet of Kore-eda's habitual embrace of life -- an honestly and authentically brightly-colored new entry (may there be many more to come) in what by now stands as an impressively large gallery of films from one of the most warmly observant, visually delightful, honestly humanistic writer/director currently working. The transfer of the film presented here, which widescreen-anamorphically preserves its original theatrical aspect ratio of 1.85:1, is quite nicely done. The often delicate color palette and lighting (differently calibrated for nighttime interiors, mid-day or dusk exteriors, etc.) comes through very well, and it appears that most if not all of its 35 mm celluloid texture has been retained, without falling victim to over-clean up via digital noise reduction (DNR). I noted very little aliasing, and any edge enhancement/haloing is kept to a barely-noticeable minimum. An excellent transfer overall. The Dolby Digital 5.1 (in Japanese, with optional English or Spanish subtitles) surround track conveys in great, rich detail all the documentary-direct dialogue and ambient noises, as well as kicking into the all-channels high-gear as the story occasionally necessitates, i.e., putting us sonically right up close to those bullet trains. Everything is sonorously immediate and full, with no distortion or imbalance to muddy the aural waters. I hesitate to describe Kore-Eda Hirokazu's I Wish as gentle and sweet and fail to do justice to its surprisingly powerful emotional heft (which I don't hesitate to admit brought me near tears), but those descriptors have to stand, since the film's ability to move so deeply would have been impossible without its fearless embrace of gentleness and sweetness. That doesn't, however, mean that there's even a smudge of sentimental goo to mar its story of two brothers forced to live apart because of their parents' divorce; these siblings' and their friends' fanciful ideas about how, by being at the right place at the right time, they can make their wishes come true; and, most importantly, the oft-invisible but unbendingly strong familial connections that hold together all the everyday routines of their lives. The film isn't projecting some fantasy of childlikeness onto its kids, but taking its characters' childish attributes, positive and negative, on good faith, and it makes a world of difference: Neither unfairly pigeonholed as precocious spewers of sass or falsely ennobled as guileless naïfs, 12-year-old Koichi, his 8-year-old brother, Ryu, and their friends become real in a way that's authentic and compelling, as do their fallings-out, reconciliations, misadventures, and newfound wisdom, all of which threads its way seamlessly through the film's calm, quietly rich portrait of family life in contemporary Japan. I Wish is decidedly "lighter" than Kore-eda's other, more dramatically fraught films with their frankly grown-up problems, for example 1999's After Life and 2008's Still Walking (or 2004's Nobody Knows, in which the children are unfairly forced to handle grown-up problems before their time), but it's very much of a piece with this wonderful, unfailingly humanistic director's genuinely open-hearted, unabashedly beautiful body of work, which at this point is already a constellation replete with enough stellar works (I Wish absolutely included) to distinguish it as one for the ages, an especially bright spot in postmillennial world cinema. Highly Recommended.